What is the Boost Screen? On TV-TWO, users receive the major share of the advertising revenue generated on the platform. With the Boost Screen, we are happy to offer another exciting opportunity to Boost their earnings! Based on the location of the user, we offer different tasks, like downloading an app or completing a survey. 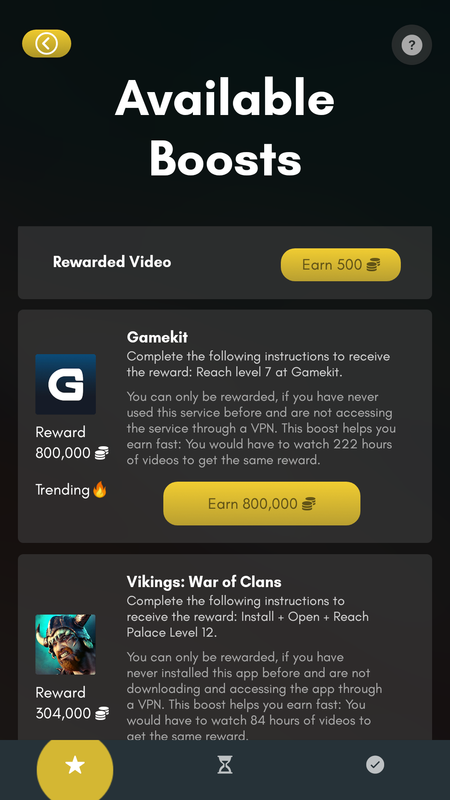 Once the boost is completed, the user is granted a reward. How to Boost your earnings? When watching your favorite video content, click the Discover Boosts button. This leads you to the Available Boosts screen. Here, you may scroll through the list of boosts. Once you found an attractive offer, just click the Earn button and follow the instructions. Please make sure to read the description. You can only be rewarded, if you have never used the service before and are not accessing the service through a VPN. Why is my Boost in Progress? Under the Boosts in Progress screen, you have an overview of all unfinished tasks. Via the Not Done button, you may continue a task until it is finished and rewarded. When clicking Help! I have a question, you can get support. We are happy to help you. Please allow up to 24 hours for the Boost progress to be updated. Where are my Boost rewards? 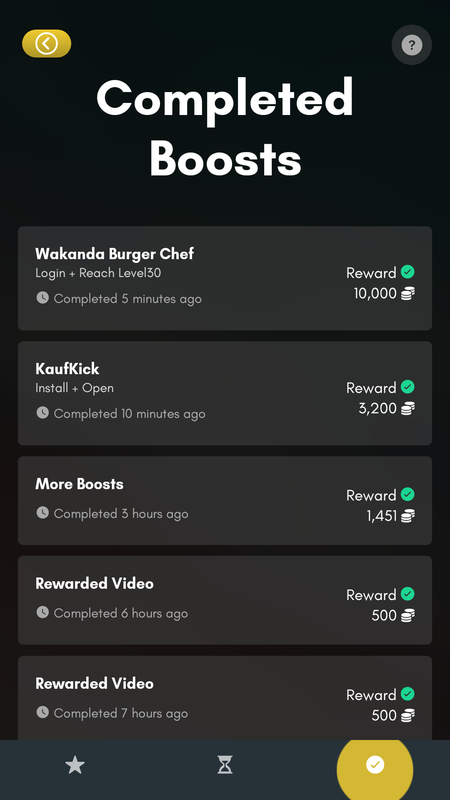 After a processing time of 24 hours, the Completed Boosts screen shows your earnings. Likewise, the Balance page displays an overview of your score. 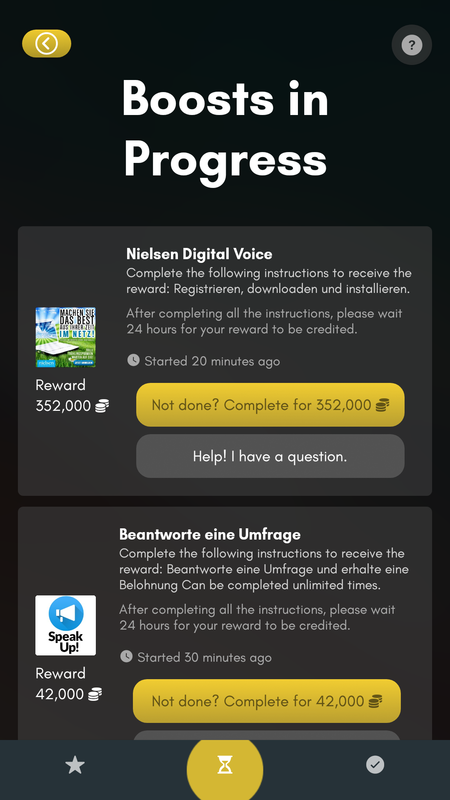 If your tasks is still under Boosts in Progress although you are finished and have waited for 24 hours, please click Help! I have a question in order to send your support request. Where do the Boosts come from? We have entered multiple business partnerships to enable the offering. When the revenues increase, your rewards increase. For more info, don’t forget to follow the latest news on Telegram, Twitter (@tvtwocom), Facebook, or Medium.